This Daily Devotional Journal Highlights 365 of Scripture's Best Promises! For more than 30 years, The Bible Promise Book® has blessed millions of readers with Gods most encouraging promises at their fingertips. Now this daily devotional journal presents 365 of scriptures best promises in a years worth of inspiration and life application. Organized into weekly themes, this devotional highlights more than 40 topics from A to Zfrom Adversity and Gratitude to Forgiveness, Patience, Salvation, and Wisdom. Each reading includes a title, Bible promise, devotional thought, and space for journaling that brings better context and understanding of the scripture. 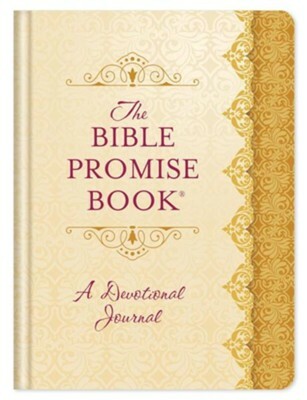 Great for daily quiet time or Bible study, The Bible Promise Book®Devotional Journal is perfect for women of all ages. Barbour Publishing is a leading Christian book publisher offering bestselling books featuring exceptional value, biblical encouragement, and the highest quality. Barbour is the home of New York Times Bestselling author Wanda E. Brunstetter along with well-known fiction authors Gilbert Morris, Olivia Newport, Michelle Griep and many others. If your interest is Christian Living or Bible Reference, youll find excellent titles by bestselling authors Josh McDowell, Jonathan McKee, Debora Coty, and Stephen M. Millers The Complete Guide to the Bible. Barbour also publishes the top classic devotionals God Calling by A.J. Russell, and Come Away My Beloved by Frances J. Roberts. With inspirational Christian books available in all genres--fiction for adults and children, Bible Promise books, devotionals, Bibles, Bible reference, puzzle books, and gift books there's something for everyone to enjoy. I'm the author/artist and I want to review The Bible Promise Book &#174 Devotional Journal: 365 Days of Scriptural Encouragement.